If you want to know how to get to Khao San Road from any part of the city you are lucky, this famous backpacker street is accessible from anywhere in Bangkok , you have boats, buses and taxis at your disposal as some of your main options. The subway (MRT) and the Skytrain (BTS) are not the best way to get to Khao San Road, there are no stops in the whole Rattanakosin area where Khao San is located, so it is advisable to take a boat from the Chao River Phraya or taxi that leaves you in the area. Here are some of the best ways to get to Khao San Road. 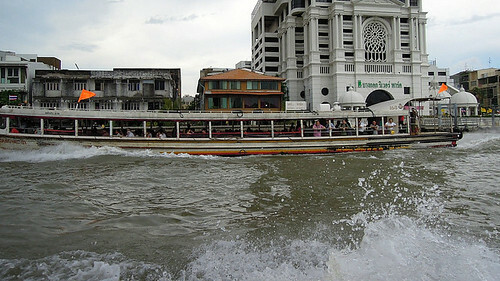 You will find express boats of the company Chao Phraya Express that will take you to Khao San Road, they will be cheap, if you are in the center of the city you should go to the Chao Phraya River and for that it is best to take The Skytrain to Saphan station Taksin from which you can go to the port of Sathorn where you can catch any of these boats. You have to go north to the port of Phra Arthit , you must take the boats with orange or blue flag, the trip usually takes about 35 minutes because you will have to make some stops before and the price is usually between 15-20 baht. The most important ports to consider when visiting Khao San Road are the port of Tha Chang where the Royal Palace (Grand Palace) is located , the Tha Tien port where the Wat Pho and the Rachawongse port are that will allow you to go to the Yaowarat street, the place where the neighborhoods of Chinatown and Little India meet . The p uert or Sathorn will allow you to take the skytrain that connects the areas of Silom, Sukhumvit and Siam Square. If you are traveling by bus for the first time in Bangkok, it may seem a little complex, if you want to get to Khao San Road and do not want to take the boat, your next option is the bus and these are some of the bus lines that take you to the Bangkok's famous backpacker street. - Line 2 , goes from Sukhumvit to Sanam Luang and goes through the street of Ratchdamno in Klang which is very close to Khao San Road, its price is usually between 5-8 baht. - Line 3 , this bus has air conditioning, leaves from the northern bus station (Mo Chit) and goes through Chakrabongse which is next to Khao San, this line also stops at the Chatuchak weekend market, the trip It costs about 7 baht and lasts about 30 minutes. 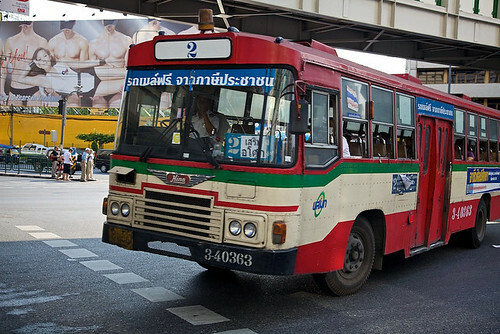 - Line 15 or 79 , these bus lines stop right in front of the Ratchadamnoen 7-Eleven which is near Khao San Road. - Line 53 , it is taken near the port of the Hualamphong train station and goes from Phra Athit to Rattanakosin and Yaowarat, costs 7 baht and takes around 7 baht. Most taxi will try to ask you about 200-300 bahts in addition to the taximeter if you want to get to Khao San Road (the meter can cost you 80 baht from Silom or 100-150 from Sukhumvit) , they will usually tell you that Khao San Road is too far to charge Only the taximeter trip, it is best to reject it and find a taxi driver who does his job. If you want to know how to go to Khao San Road from the S uvarnabhumi airport in Bangkok you can do it by taking the airport train from the City Line line to Makkasan (it costs about 35 baht) and then take bus 556 which is just opposite from the station and leaves you at the Democracy Monument, from there you can walk to the backpacker's street. You can also take the Airport Rail Link (train) to Phaya Thai on the City Line (it costs about 45 baht) and take the bus line 59 that will leave you at the monument of democracy from where you can walk. 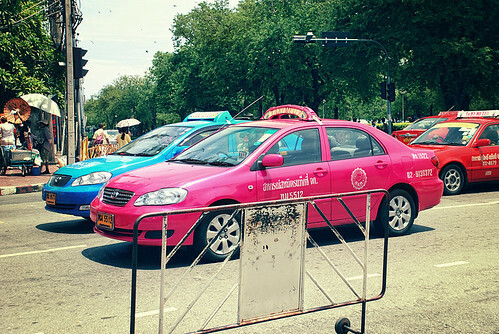 The taxi ride will cost around 400 baht. If you are at the Don Muang airport in Bangkok, the best way to get there is to take bus 59 to Phaya Thai or Victory monument, you can also take a taxi to the airport exit that will cost you around 400 baht. Do not forget that if you want to know more about this famous street you can visit our Khao San Road Guide.